I can’t believe I haven’t discussed this book already. I think I’ve been so focussed on introducing aspects of the movement that are less well-known that I have slightly neglected the classics. 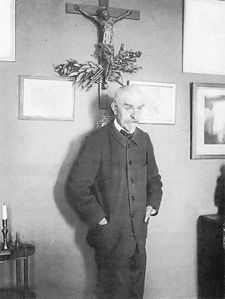 And Joris-Karl Huysmans’ A Rebours (usually translated into English as Against Nature or Against the Grain) is quite possibly the classic Decadent text. Huysmans (1848-1907) wrote A Rebours in 1884, fully expecting it to be a complete flop. Instead, it became notorious. Many critics were appalled by its apparent lack of morality, while young Dandies and Aesthetes were attracted to it for its idolisation of art and sensation. It quickly became known as a guidebook to Decadence. As if further recommendation were needed, it is widely believed to be the unnamed “poisonous French book” read by Dorian Gray, which contributes to his corruption. Having said that, A Rebours is not a book I would recommend to a complete beginner in Decadent literature. Those unfamiliar with the style and ideology may find it difficult to relate to, not least because there is no real plot to speak of. Hardly anything actually happens. The basic premise is that Des Esseintes, the novel’s anti-hero, has become so disillusioned with modern society and the pettiness of those around him that he decides to hole himself up in a rural French mansion, cut off from everyone, and dedicate himself to the pursuit of sensation. Finally, his fragile health breaks completely, and he is compelled to return to Paris. I love this book. As far as I’m concerned, plot and action don’t matter so much as long as a book is beautifully written and gives me something to think about. And A Rebours certainly does that. * Des Essseintes has a very eccentric take on interior design. He decorates one room of his mansion like the cabin of a ship, and spends days agonising over which colour will be aesthetically pleasing in both daylight and candlelight (he eventually chooses burnt orange). * He rhapsodizes over the art of Gustave Moreau, and collects etchings depicting torture and death. * A whole chapter is devoted to Des Esseintes’ library. He expresses contempt for the popular fiction of the day, but greatly admires Baudelaire and Verlaine. 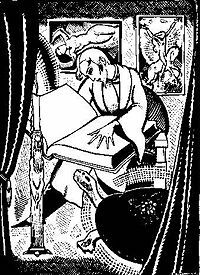 He also expresses devotion to the more controversial of the Latin authors such as Petronius. *Des Esseintes develops a love for perfumes, and the scents evoke memories of his former lovers, including an androgynous female acrobat, and an adolescent boy. * He decides to collect exotic flowers, which resemble diseased organs, alien entities, and strange sculpture. He can only love things of nature when they look artificial. * In one of the more amusing passages, Des Esseintes, after reading the novels of Dickens, decides to take a trip to England. On the way to catch his boat,he stops off at a British cafe in Paris, and eats a vast meal surrounded bt Englishmen. After this, he decides that he might as well return home, because he has had a better English experience than he would if he went to the actual country. * He decides to decorate the shell of a tortoise he has purchased with gem-stones in order to increase its artificiality. The unfortunate creature promptly dies. There is something touchingly vulnerable about Des Esseintes that makes you want to continue reading in spite of how appalling his behaviour often is. His complete devotion to his Decadent lifestyle, in spite of his detrimental impact on his health, and despite the fact that it never really gives him the satisfaction he craves, is almost admirable. He is simply trying to find the right way to live. And isn’t that what we’re all doing? A Rebour is indeed the poisonous/liberating guide book that Dorian Gray has bound in various colours to suit his moods; the book that Symons described as “the breviary of the decadence.” Certainly the most decadent of Huysmans novels- but it gets some close competition from the Satan drenched La-Bas in which, ironically, the protagonist Durtal lambastes ‘decadent’ writers! I haven’t read La-Bas yet, but I’ve wanted to track down a copy for ages. Huysmans did seem to have a very ambivalent relationship with Decadence. From what I’ve read of his letters, he seemed to be constantly dissatisfied with how people perceived him and his work.